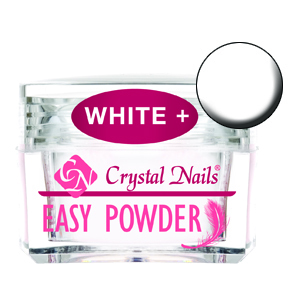 The new generation Easy Powders are one of the most determinative new products of the new season. They do not contain ‘bigger’ grains therefore filing will not require much effort anymore. Your favourite Crystal Nails ﬁle slides on the nail surface easily like a feather. Optimal cure time: the White+ and the Cover+ colours cure slower, for the perfect French effect and smile line; the Clear+ and Pink+ colours cure faster, to allow you to create the perfect nail as setting times will be even during construction. Work slightly wetter with this powder for perfect control.